I look at many police websites, instagram etc...and I see guys running around in Desert Multicam outfitted like a Marine about to storm Fallujah. When I look at this chart assembled by Forbes and Statista I see a big nothing burger. MRAPs are the big item and those were gonna be thrown away. 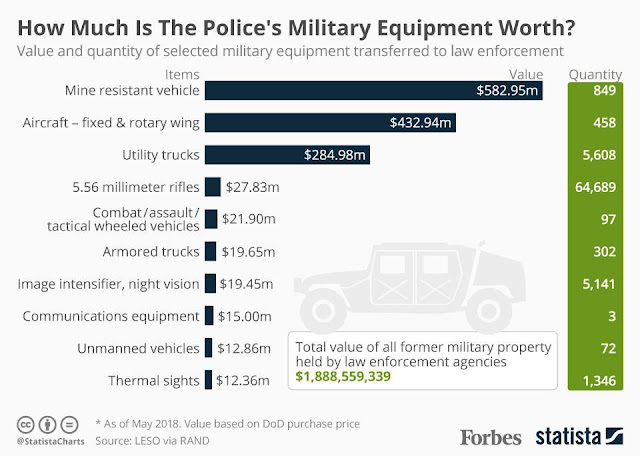 They're being used by SWAT transports in most areas which saves them the cost of buying a brand new Lenco Bearcat or some other high dollar vehicle that would break many depts. Next up are helicopters? Until I see rocket launchers and gatling guns on them they're pure enablers, not attackers. They're about as benign as it gets. Comm, UAVs, Sights, utility trucks, rifles....not even a wisp of concern. The more I look at the actual list the more I see that this is a problem that the police have foisted on themselves. Policing by its very nature has militaristic elements. Add in the fact that certain people have weapons and have been trained to effectively engage them and its natural that they would seek at least equivalent and hopefully for society's sake overmatching firepower. So if its not the gear then what is the problem. The cammies they wear point solidly at the issue. They're dressed like Soldiers or Marines in a foreign nation conducting combat ops. Only they're in the US doing this! The people that are to serve and protect are decked out like they're waging war...and that means that they're prepared to engage society. I know that's taking it to an absurd extreme but the force of connection is there. This is an image problem. They can easily fix it. Toss the multicam away and pick a dark grey, sheriff green...anything but stuff the military wears and they'll go a long way to winning this image war. But when it comes to the equipment its nothing. Nothing at all.